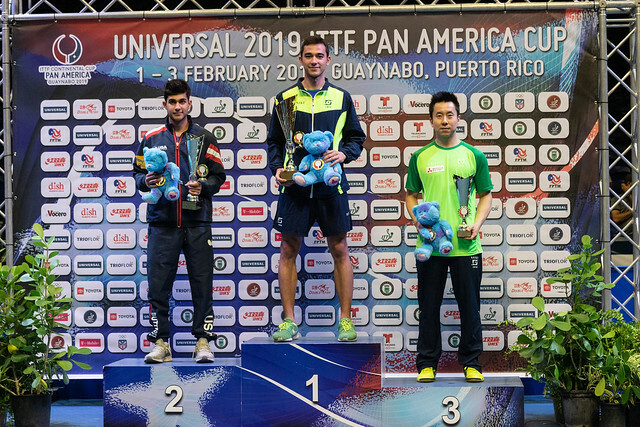 Winner in Asuncion, the top seed in Guaynabo, Brazil’s Hugo Calderano retained his men’s title at the Universal 2019 Pan America Cup on the evening of Sunday 3rd February. At the final hurdle, he beat Kanak Jha of the United States, the no.4 seed, in five games (11-2, 12-14, 11-3, 11-8, 12-10). Quickly into his stride, Hugo Calderano dominated the opening game; a lesser player would have succumbed to the power of the Brazilian, Kanak Jha was not to be overwhelmed. He proved a most worthy opponent and underlined the progress he has made throughout the past year and more. He displayed the level at which he can play and that was the crux of the matter, Hugo Calderano was a level higher. Success for Hugo Calderano, earlier in the evening there had been more success for Brazil; Gustavo Tsuboi had secured third place. The no.2 seed, he beat Marcelo Aguirre, the no.4 seed, in five games (11-6, 11-6, 3-11, 11-3, 11-5), a contest that was more intense than the score line may suggest. Thus for Gustavo Tsubio it was again one place lower; in the inaugural event in San José he had emerged the winner beating colleague, Eric Jouti in the final. Last year it was runners up losing to Hugo Calderano. Meanwhile, for Marcelo Aguirre, as last year on home soil it was same again, fourth place.